What if the only thing standing between you and destiny was Ben Affleck? What if the script for Good Will Hunting fell from the sky into your living room? 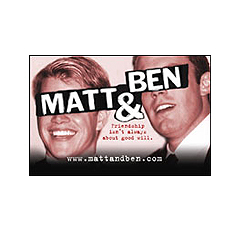 MATT & BEN is the story of a friendship in the face of ambition and outrageous fortune. Picture it. Somerville Massachusetts, 1996. Ben Affleck’s shabby, one-bedroom apartment. Ben’s there with his good buddy Matt Damon struggling to complete a screenplay. But they’re not Matt Damon and Ben Affleck yet. They’re just two guys, down on their luck, dining on junk food, waiting for that one big break. As they marvel in disbelief at how easy it is to adapt the classic Catcher in the Rye (word for word), something happens that changes everything. A package falls from the ceiling. No holes, no portals, no trap door, no nothing. From nowhere appears this package, and inside is a script – but not just any script. An excellent script, the script for Good Will Hunting. And it already has their names on it. What follows is one moral dilemma after another, framed, naturally, by a few good fights. Is the price of fame worth cheating yourself? Can a friendship survive a business deal? Does human nature really allow for true collaboration? Why does Casey always call at the worst times? And why do Matt & Ben look like two girls dressed up as guys? The answers to all these questions and more will be answered in the original stage play: MATT & BEN.